UPDATE: The FAA Re-Authorization Bill of 2018 was approved by the Senate and signed into law by the president on October 5. The US House of Representatives approved the FAA Reauthorization Bill, which includes strong “Union Made” language. The bill is now headed to the Senate. “Machinists should be very proud of the work that we’ve done together on this bill,” said District 141 MNPL Director Dave Roderick. The IAM141 MNPL, or Machinists Non-Partisan League, is the legislative department of District 141. The IAM141 MNPL works to make sure that airline workers have a seat at the table as laws that impact their industry get made. 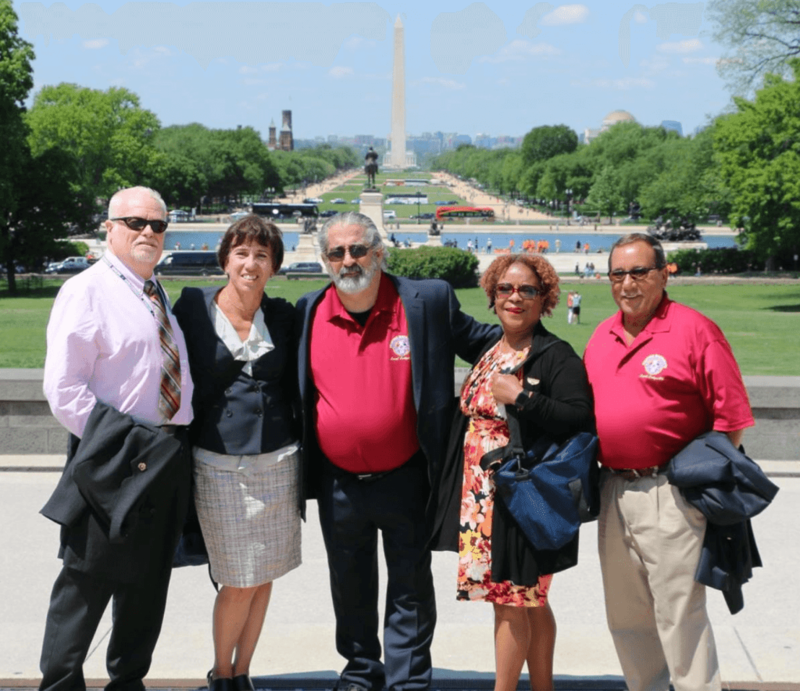 IAM141 in DC: (From left: IAM141 Legislative Director, Dave Roderick, IAM141 Communications Coordinator and New Jersey State Council of Machinists President Ines Garcia-Keim, Ross DelConte (Local 914 EWR), Darlene Williams (Local 1487 ORD), and Local 914 EWR President, Bill Gula. IAM Activists aggressively fought for two years to have Congress include pro-airline worker language in H.R.-4, the proposed $17 billion, five-year Federal Aviation Administration Reauthorization Act of 2018. The result of all the MNPL work is a final bill that contains many of the top priorities of IAM Members within the commercial aviation industry, as well as important improvements for the flying public. Longer Rest Periods for Flight Crews. This is what it looks like to be “off duty” if you’re a flight attendant. Exhaustion in the skies is much more than a workplace annoyance for flight attendants; it can also be a serious safety issue. 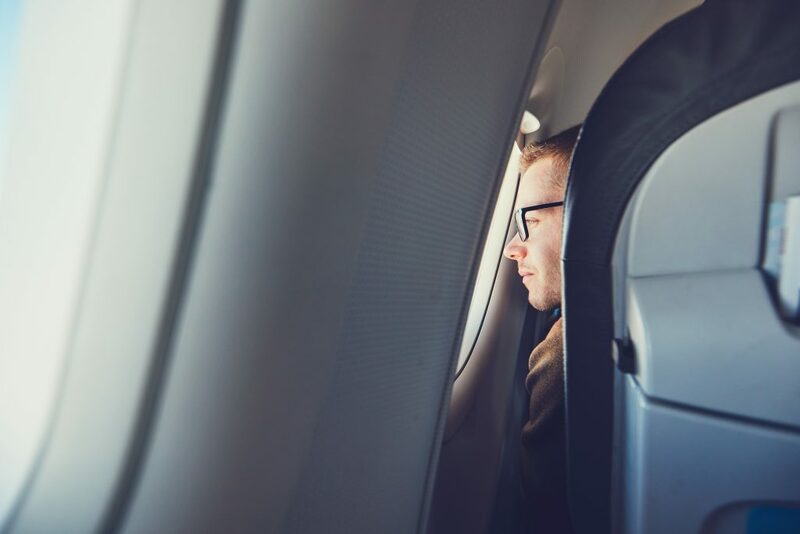 Flight crews are responsible for the security of the aircraft cabin, while they also perform functions that create the primary customer experience for most passengers. The FAA Bill will help make flights safer, and help Flight Attendants enhance customer service by increasing rest periods to at least ten uninterrupted hours between shifts. 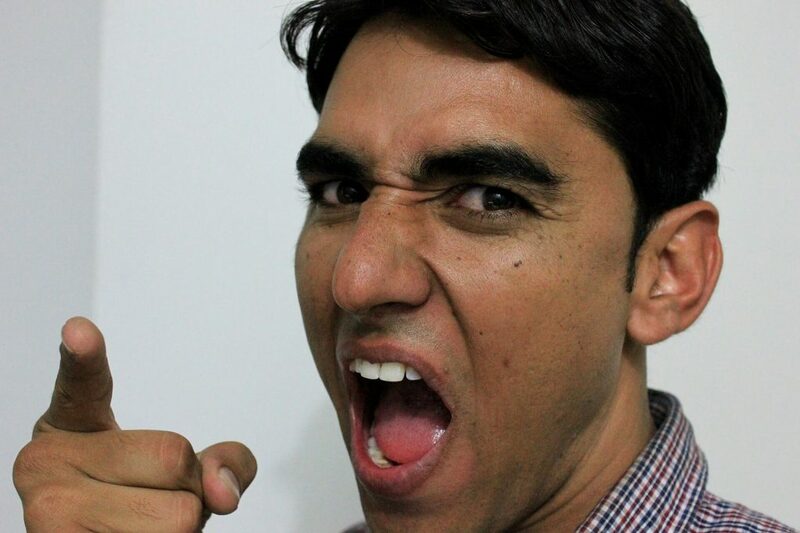 Abuse Protections for Customer Service Agents. Now passengers are legally required to chill. Airline CSAs have critical security responsibilities at our nation’s airports, and yet are often the victims of severe abuse by passengers. Hundreds of attacks against gate and ticket counter agents occur every year, and many go unreported. IAM Members have lobbied to require airlines to implement an assault prevention plan that protects CSAs from abuse while they are on the job. The new FAA Bill will require the immediate reporting of any verbal or physical assault on gate and ticket counter agents and establishes protocols for law enforcement to assess and take action before a passenger involved in a violent assault is allowed to proceed through security or board an aircraft. Airlines must implement the new protections and training within 90 days of the reauthorization, and the Secretary of Transportation will also oversee a study that will gather data and make recommendations for future training and best practices. Feel Free to Remain Seated. The new FAA Bill will make getting bumped less of a drag. Bumping Protections are included in the new FAA Bill. The new rules specifically address a well-publicized incident that took place last year, as the bill prohibits the “involuntary bumping of passengers once they have boarded the plane.” It looks like once the gate crew has cleared you to board the plane, you’re good to go. Soon airplane seats may become less horrible. 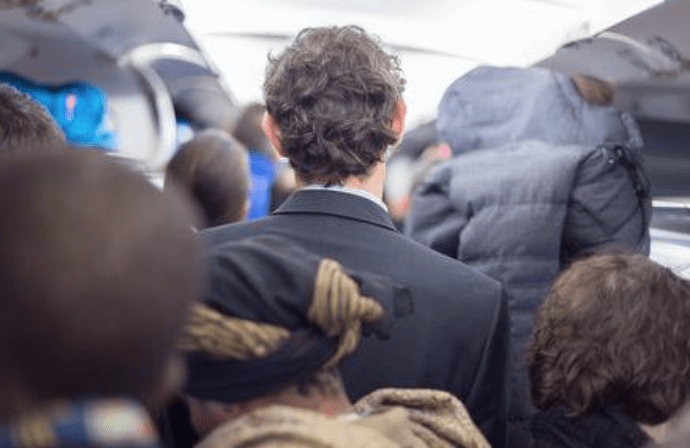 For passengers that are big or tall or anyone with a bad back, air travel is more than just a pain. It can literally be torture. Air travelers that dread long hours in cramped seats may have some welcome relief on the way. 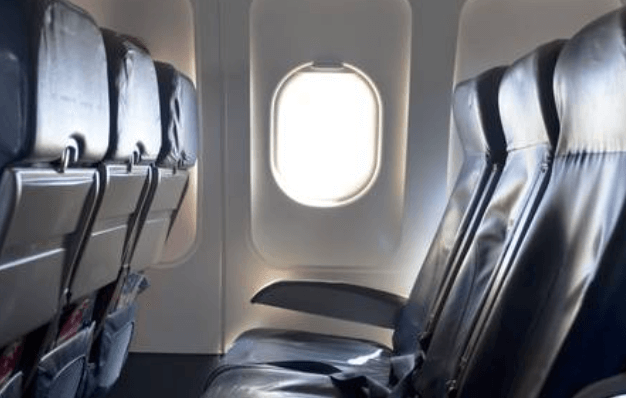 The bill requires the FAA to set minimum standards for passenger legroom and seat width. The bill also requires all newly manufactured commercial passenger aircraft to be equipped with secondary cockpit barriers, bans in-flight voice cell phone calls, requires the regulation of service and emotional support animals on aircraft, and improves the safe transport of lithium batteries. The bill now moves to the US Senate for approval. Please contact your Senator and urge them to keep the pro-airline worker language in the FAA Reauthorization Bill of 2018. 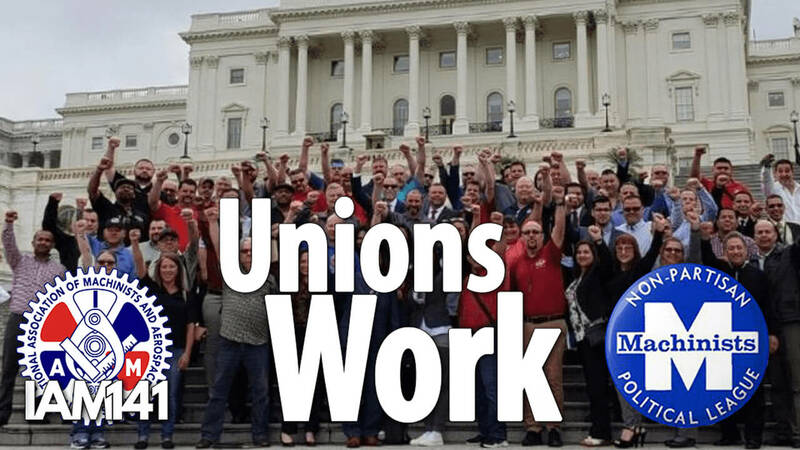 Tell your Senator that you support airline workers and the new FAA Reauthorization Bill Now. The IAM141 Machinists Non-Partisan League is funded entirely through voluntary donations from members like you. To become a supporting member of the IAM141 MNPL, please complete an MNPL Automatic Payroll Deduction Card for any amount today. Cards can be found by visiting the MNPL page at IAM141.org.